After having devoted an entire column to my unfortunate experiences in the world of underwear, it seems only fitting to turn to what bedevils almost every man: what to do about orphan socks. Socks have never been more important. With the decline in use of the tie in the business environment, socks have become a way for a man to make his personal statement. A pair of black executive length socks underneath that standard issue gray suit signals that the wearer is gunning for the top, whereas a pair of recreational length Jerry Garcia or Grateful Dead designer socks signifies the wearer marches to the beat of his own drum even in the most conservative environment. Socks have a significant drawback: they get lost. You consign a pair of socks to the laundry and you get back one freshly cleaned sock; its companion nowhere to be found. You may get lucky on occasion and find it in the dryer or wrinkled up in some bedsheet, but usually it will simply disappear. I have an impressive collection of orphan socks, which grows steadily. Why I bother to keep them I don’t know. It’s not as though one day six months from now a stranger is going to knock at my door and proudly deliver a missing sock back to me as its rightful owner. This brings me to the crux of the matter. What is the right purchasing policy to adopt in order to minimize the heartbreak of orphan sock? Some argue in favour of the ‘uniform purchase’ approach, wherein you don’t just buy one pair at a time; you buy enough pairs to last you from washday to washday, as well as several extras to compensate for predictable sock disappearance. Just as important, you buy identical socks. That way, proponents argue, if you lose one sock, you are always sure to find a mate for the remaining one. There will never be more than one orphan sock in your collection; you will always have an even number of remaining socks every second disappearance. Others, myself included, are prepared to adopt the less boring ‘high risk, high reward’ approach of buying interesting socks a few pairs at a time; after all, who can resist a package of three pairs of Star Wars branded socks for $9.99. The risk is that you’ll create many more orphan socks; the reward is that you develop a reputation as someone that uses his or her socks to make a fashion statement; someone prepared to undergo the high orphanage rate as part of the cost of being different. Wait, you say: perhaps you can have both. Buy enough Star Wars socks to cover off the uniform purchase approach. Theoretically, that would work, if you could find enough identical socks. This strategy locks you in to your singular fashion statement until your socks wore out or you were prepared out to restock your complete inventory when you grew tired of them. There are other advocates of mismatching. The Washington Post reported on a company that markets mismatched socks especially for children. The claim is that wearing mismatched socks teaches kids to embrace their differences and insisting that it is cool to stand out from others. Cool, especially if your parents are paying. The acceptance of mismatched socks as a cure for the heartbreak of orphan sock would be a major change in social convention. After all, who would want to be caught dead wearing one garish Homer Simpson illustrated sock and one elegant polka dotted Ralph Lauren sock? Still, revolutions have begun over less. 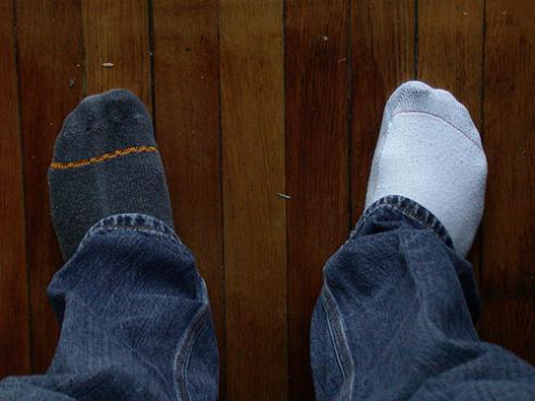 Maybe it’s time we jumped into mismatching with both feet, even if they’re in different socks.